In my young days I was a member of the Brighton & County Harriers. 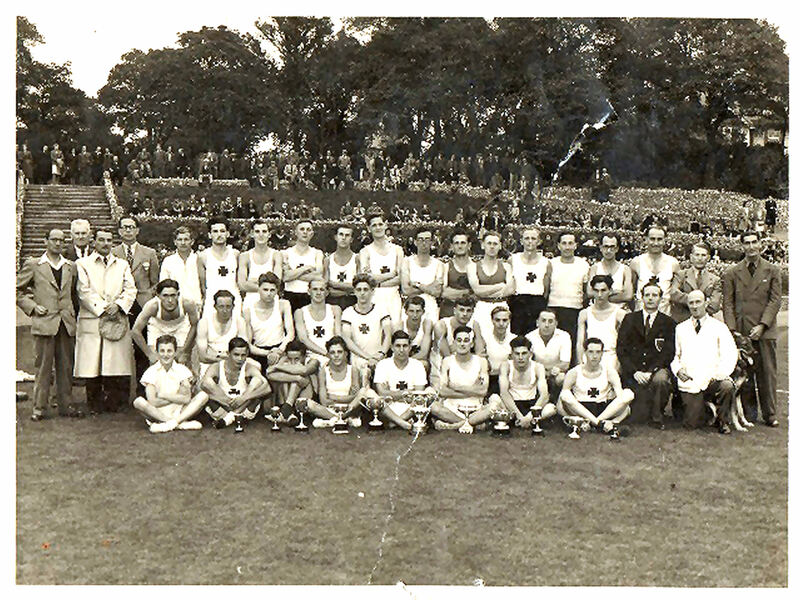 This photo was taken c1943/44 at Preston Park, which was our original training ground. Eventually we moved out to the Greyhound Stadium in Hove, and changed our name to Brighton & Hove Athletic Club. I am the middle boy in the front row. Do you recognise yourself or anyone else here? If you do please leave a comment below. I was in the photo above taken in 1945 at Preston Park cricket ground. I am the boy in the front row at the furthest right sitting down. I have fond memories of these days in the Brighton and County Harriers and my running days. My father, Bert Darrington, was a member in the 1930s and I still have his medals and prizes for races he won in about 1932-1935. Is there anyone left who remembers those times? Fay Symes (nee Darrington). My Dad (Herbert) Maurice Martin was also a member probably in the 30s. We had the cups and medals but they have been passed on. Has anyone got any information about Brighton Harriers from its foundation date until 1899? Also does anyone know if Lewes had a harrier club in this time slot. I have tried all the obvious sources and have drawn a complete blank. Many thanks.